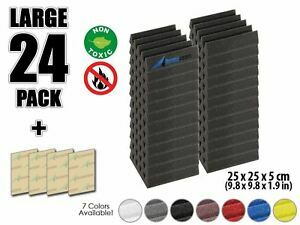 Détails : Arrowzoom 24pcs Acoustic Wedge Foam Tile Sound Absorption Panel 9.8*9.8*1.9"
Arrowzoom 24pcs Acoustic Wedge Foam Tile Sound Absorption Panel 9.8*9.8*1.9"
6 Pack Acoustic Studio Foam Tile Pad Wall Panel Soundproofing Wedge 12"x12"x2"
I didn't have any high hopes buying these as most China foam isn't exactly professional gtade, but these blew me out of the water. 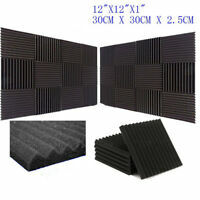 The material is thick, and is perfect for sound proofing/echo suppresion. It isn't completely fire proof as stated, but very resistant nevertheless. It doesn't smell bad, it's easy to install and it did a great job for my vocal booth. The package comes compressed, but all you need to do is unpack the foam,and leave it to regain shape for a couple of hours, recommended is 24 , but i waited only around 5 hours. I can only recommend Arrowzoom, i bought their bass traps too and i'm verry happy with them as well. Money spent well. that 's really Great! These panels are for sound absorption. Tried to put 24 tiles first to try out and the distortion, echoes and reverberations are greatly eliminated. Also, these are fire-retardant which is amazing. They're light but firm and just the right thickness that works for me. Easy to install with their adhesive foam tapes but I guess much better if you'd get the spray if you plan to ensure that it'd stay on your wall for a long time.